"Mostly on social networks we are just wasting our time because their is nothing new after an hour of standing on site." "Technology is making us humans increasingly dependent upon machines. Physical exertion is decreasing. It is adversely affecting our healths." "Facebook is an addiction and I waste most of my time in winning or loosing arguments/comments fights over facebook." "The survey results would be interesting and might help people in making better use of these technologies." "Now a days facebook offers some social games, like farmville and cafeworld, in which you can not only play your game to achieve next levels, but can also compare your performance with other players... I started playing these sort of games when a close friend introducd me to them, but now i am a sort of addicted to them, i plan my daily activities according to them... you can say that my virtual world is more important to me than my actual world." "As far as addiction is concerned i think facebook is level 2 addiction whereas twitter is level 1 addiction :) . " "i myself over use these technological devices.i have less self control while using them resulting in bad grades." "It will be interesting for you to know that why Bill Gates quits facebook. He think that these kind of tech things waste time if not handle with care." "Its a good issue. we all r facing it n suffering from it." You can analyze the social networks and high-tech effects on our behaviour and performance. Yossi Vardi, social technologist (the man behind ICQ, that he sold at $400m to America Online), warns “The more successful the high-tech sector, the more frustrated and unhappy the rest of society could become.” . I conclude the major effect are self unreliability, low self control, weak commitments, and inability to meet deadlines. Some studies has exposed other effects too e.g. (physical) social disengagement, inability to control internet use, and restlessness when attempting to cut down on internet use (i.e. 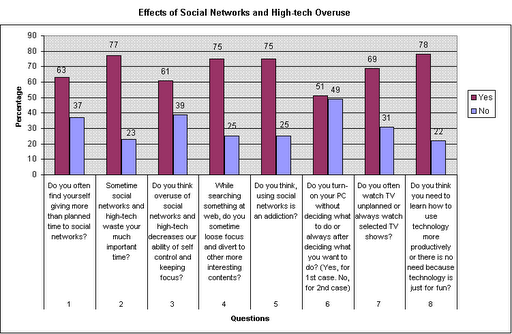 internet addiction) , decrease in attention span, and prevention in developing social skills . Psychologically, the habit of doing things that we infact want to avoid, leaves bad effect to our unconsciousness. And we slowly become victim of our own ill trained unconsciousness. As much we continue, more intensive it becomes. It continues until we make strong commitment to avoid it, and practice self defined limitations. Although discovering causes of the overuse need completely new study. I personally think, some of the above mentioned effects are also causes too. I want to discuss only two fundamental causes very briefly i.e. Muting the Consciousness and Hyperbolic Discounting. Muting the Consciousness is very destructive state of mind. In it, user deliberately do not review what he is doing or what important tasks are in to-be-done queue while consuming high-tech contents. Because he is aware that if he compared the contents being consumed with the queue items, the brain will reject the contents, which the user don’t want. One might think, how it is possible that a person with all senses can close them consciously? In simple words, the answer is, these senses are only useful if we choose to use them. If we close them, they become 100% useless. It is as simple as when we close our eyes we can’t see even in the full day light. We do not always overuse by muting the consciousness, sometime we do it consciously, even if there are important tasks in the queue. Why? It is mostly because of user’s procrastinate attitude (i.e. postponing the important tasks) . But the next question is, why one procrastinate? Different studies shows that it is because of the Hyperbolic Discounting i.e. humans generally prefer the immediate pleasure over later, for example, studying to get grade A seems distant but one can enjoy spending 1 hour on Facebook feeds or Twitter tweets right now. We can’t stop ourselves from social networks and high-tech overuse if we do not have some agenda for next minute, next hour, next day, next year, and for whole life. We must understand the effects and be equipped with techniques to make better use of high-tech. And when riding high-tech, we must be consciously aware whether we dictate or are being dictated by it. In business language, who is consumer? We humans or high-tech. Infact high-tech and social networks have potential to improve and damage the society. Its we, who select what to do of it. While studying its negative effects, we must not forget its role in empowering us. Using high-tech as utility is our power. Misuse of power always become a weakness, we must not let it become our weakness. The more the power, the more control we need to exercise it.
. In this article, the term “overuse” infact mean misuse, inappropriate use, or direction less use, etc.
. “The Social Technologist; Face Value”, Economist, January 5, 2008.
. “Internet Paradox: A Social Technology That Reduces Social Involvement and Psychological Well-Being?”, by Kraut, Robert; Patterson, Michael; Lundmark, Vicki; Kiesler, Sara; Mukophadhyay, Tridas; Scherlis, William. American Psychologist. Vol 53(9), Sep 1998, 1017-1031.
. "Internet Addiction: The Emergence of a New Clinical Disorder" by Clinical Psychologist Kimberly Young, Assistant Professor of Psychology at the University of Pittsburgh at Bradford in Pennsylvania, published in CyberPsychology and Behavior, Vol. 1 No. 3., pages 237-244. PDF.
. Baroness Greenfield, Neuroscientist, Director of the Royal Institution of Great Britain, and Professor of Synaptic Pharmacology. Related Web Link. It is vital for the instructor to speak to the address with a decent way. I have no uncertainty the capacity of the educator however pass on the data ought to be simple thus that understudies can without much of a stretch get it and you can join cv writing company for useful info. The strategy that you portray in this article is so pleasant.